ARID Tech Products have made their way around the world. 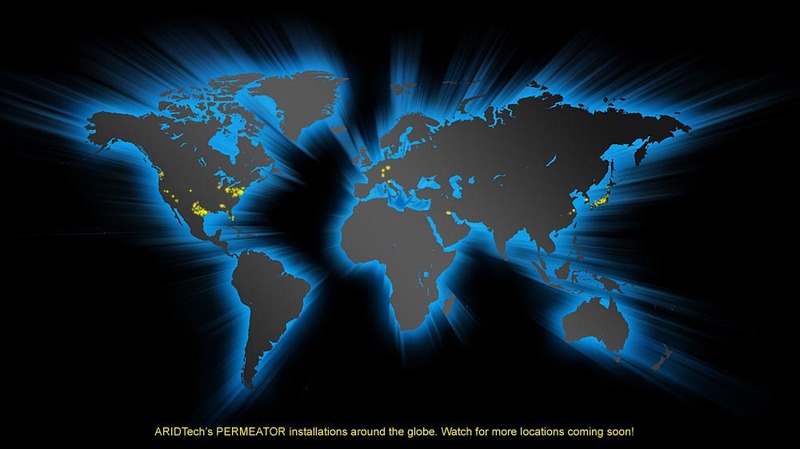 PERMEATOR systems are installed in USA, Germany, Switzerland, Luxembourg, Kuwait, Japan, Italy, S.Korea, and China. In the United States, many motorists began to feel uncomfortable when fuel pump prices reached $4.00 per gallon; however, in many foreign markets, the prevailing fuel pump prices are on the order of $7.00 or $8.00 per gallon. At these elevated prices, the payback period on Permeator is dramaticlly reduced, even at modest montly throughput volumes. In addition, with newly promulgated regulations throughout the European Union (EU Stage II Petrol Vapour Recovery Directive), the need to capture vapors has been formalized, and the need to contain the captured vapors will soon be recognized. "Our experience has shown conclusively that the ARID PERMEATOR is far more reliable than competitive alternatives. The PERMEATOR has the capacity to control storage tank overpressurization at Costco's large, high volume locations." "The PERMEATOR is the first product I have purchased that actually helps the environment while at the same time generating significant fuel savings. Thus, we can earn money - through product savings, while at the same time being environmentally responsible." "For emissions control equipment, PERMEATOR is unique in providing an economic rate of return that likely exceeds the rate of return on the overall retail site investment." © 2017 ARID Technologies, Inc.